Gates open from 6:30pm if you would like to bring a picnic. Doors open 7:00pm for 7:30pm curtain. Tickets £10, to include a glass of wine or juice. Tickets from our Online Box Office and The Gifted Magpie, 6 London Street, Faringdon SN7 7AA. Seating in the theatre is very limited so make sure you get your tickets as soon as possible. When Tom Lambert, botanist and TV gardening personality, receives a call from Inland Revenue enquiring about his public relations consultant Joanna Flint, he can honestly say he has never heard of her. 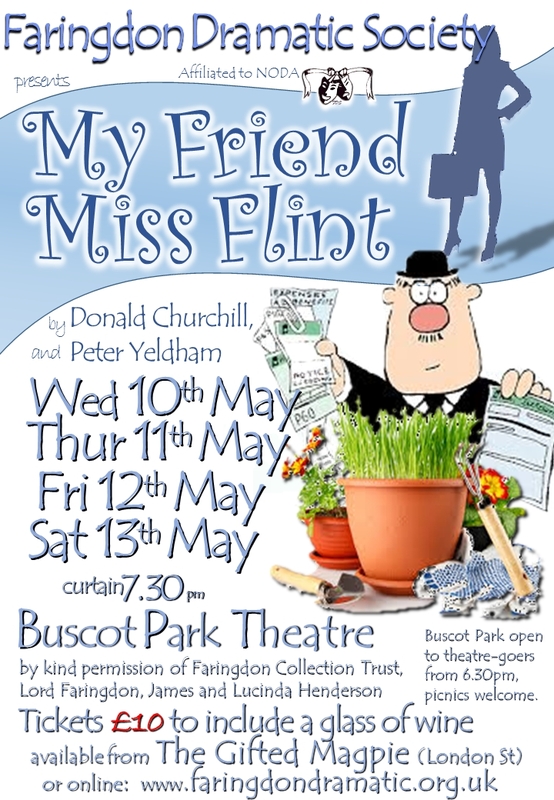 By lunchtime, he knows all about Miss Flint: his accountant and ex wife confesses that she invented Miss Flint as a tax dodge. This tricky situation sets the stage for sparkling comedy. Buscot Park Theatre has been made available to us by kind permission of Faringdon Collection Trust, Lord Faringdon, James and Lucinda Henderson. The theatre is set in the East Pavilion on the east side of Buscot House. 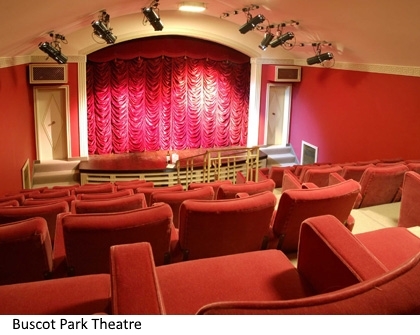 Buscot Park’s theatre dates from the 1930’s. It seats 64 in a raked auditorium with purpose-built armchairs covered in fire-proof velvet. The vaulted ceiling provides excellent acoustics and an audio system is available for the hard of hearing. There is an orchestra pit below large enough for 20, and a podium can be raised for the audience to see the conductor. A Steinway “baby grand” piano is kept in the wings. Full stage lighting is available as well as a digital audiovisual display system. Parking is available on the grounds near the theatre. Please note, there are no wheelchair facilities in the theatre. Vehicle access is via the gated entrance on the A417 between Lechlade and Faringdon. Click here for map. "Wow, I couldn't stop laughing"
I left the theatre after the Friday night's performance totally exhausted, having been thoroughly entertained. In my view the best production yet and I have seen many performed by the society. An extremely well written play full of comedy and twists and turns to keep your attention throughout, and a very clever ending well worth waiting for. The acting, both the characterisation and delivery of the smooth flowing dialogue, was superb; with some I believe new to treading the boards. I did notice one or two prompts needed but they were carried off well. I am sure the audience were sympathetic to this and could appreciate the incredible length and complexity of all of the parts involved. Linda Harrison from Highworth, Wilts. A very enjoyable evening out in a superb location. The play was very funny, and had plenty of twists and turns to keep you guessing, right until the last minute! The front of house team were friendly and helpful, making the whole thing an enjoyable experience. I look forward to your next production! This is the best production we have seen yet. The setting was exceptional too. The tax inspector and the cleaner produced clever and very funny performances. Brilliant. 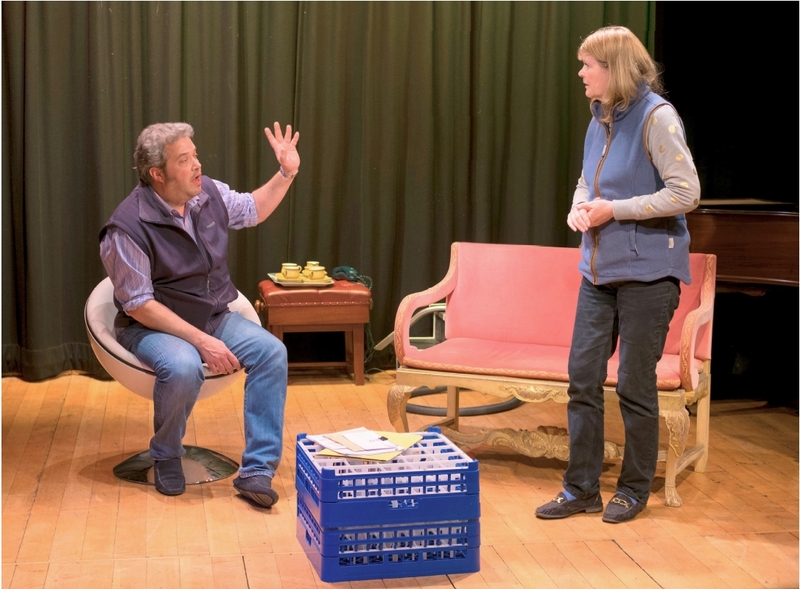 "Thoroughly entertaining: convincing performance in such an intimate theatre." Well staged with the small set and close entrances and exits. Brilliantly cast. The necessary mood change between the two tax inspectors at the end as they reconcile very convincing. A thoroughly enjoyable and entertaining evening out. Very amusing. Excellent show, well performed in comfortable venue. 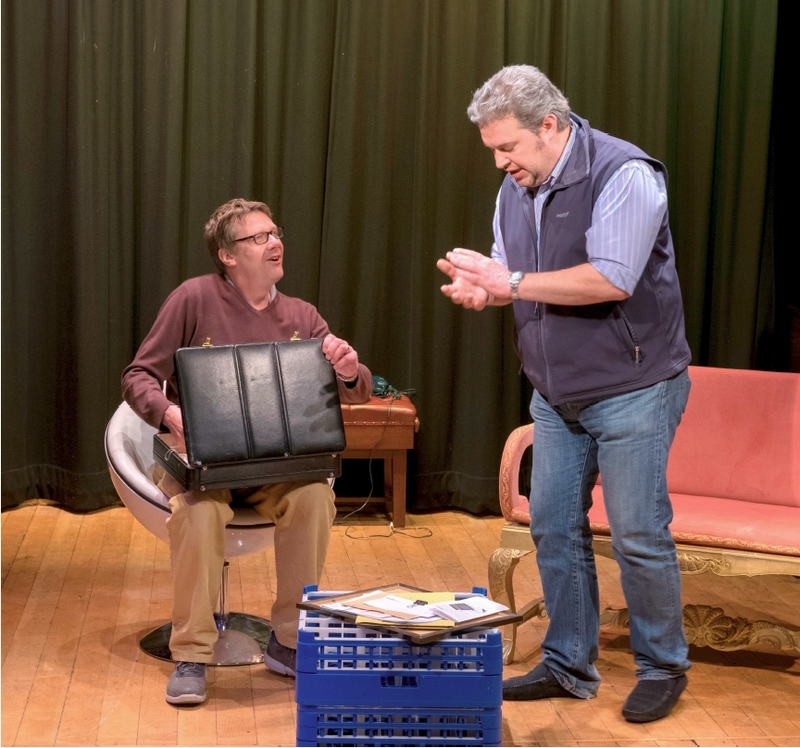 "A thoroughly enjoyable, funny, entertaining and well acted play." The set was excellent given the restraints of the size of the stage and the costumes were very much of the period. Everyone of the actors gave an excellent performance and although there were a few fluffed lines on the night I attended (Wednesday), that was understandable given the complexity of the dialogue! It was an extremely funny play and had the audience in fits of laughter. Altogether, an excellent evening's entertainment. Great so good cried with laughter Mr Dodds was hilarious. "Superb timing, I thought I was watching professional actors." Always a pleasure to watch your Society whether it be a play or a pantomime. Our grandchildren thoroughly enjoy the pantomimes. The only draw back for the children is that the seating is on one level. This latest play held me from beginning to end. Actors superb and well chosen for the parts they played. Very much looking forward to your future productions. The venue was really good in that you could see the stage from whatever position. Well done everyone. "Talented cast let down by forgetting their lines...a lot." For any performance of farce to be successful, there are two indispensable ingredients: pace and timing. Both were sadly lacking on the night in what could have been an enjoyable production. The cause was there for all to see: the actors hadn't learned their lines! It wasn't a case of one or two prompts, there were regular, achingly long pauses through the Thursday evening performance, as various actors dried up, the prompt took an age to throw them a lifeline, and the ensemble failed to do what casts normally do in such situations: just keep it going, round in circles if necessary, until they get back on track. The result was a fatal loss of momentum, rendering important sections of the play rather less funny than they should have been. The cast contained a number of experienced actors, so come on chaps – you're better than this! OK, enough slaps on the wrists. Let's look at some of the positives. There was some excellent characterisation from the cast, and Gary Bates deserves particular praise for his comic creation of Mr Dodds the tax inspector, a dull little grey man, obsessed with the boring minutiae of his unexciting profession, at the same time holding the fates of greater men than he in the palm of his hand. 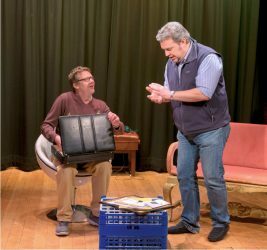 Tom Lambert's performance as Jeff Barry presented a bumbling, confused and sympathetic character at the mercy of events, as he should be. For me, however, he needed a little more energy, more rage against the predicament in which he found himself through no fault of his own. Sarah his wife (played by Janie Eyre-Brook) was superbly indifferent to the mess in which she had landed her ex-husband. But I felt that both Jeff and Sarah should have snapped and snarled at each other rather more. I wanted to wince at the sort of catty bitchiness and cruel put-downs that only ex-spouses can manage, but they were far too nice to each other! Suzanna Carter as Lucy Napier, opportunist and gold-digger, had her characterisation just about right, taking amoral advantage of Jeff when he was at his most vulnerable. Martin Waymark as Albert, Jeff's cleaner and all-round dodgy geezer, again had his character nicely drawn, laughing at his employer in the manner of a court jester, pointing out his master's foibles for our amusement. Finally, Katie Dyet deserves credit for remembering her lines and bringing a wave of energy to the second act. Her rendition of C.P. Lens, tax inspector, was assured and witty. She strode round the stage with a confident, even dominant, air, lent credence by a pair of knee-length boots. A riding crop was absent but wouldn't have come as a complete surprise. The only doubt was that such an Amazon would have been married to the anorak-ish Mr Dodds. They do say, however, that opposites attract. The set designer is to be congratulated. The stage at the Buscot Park Theatre is not large, but there was inventive use of the space, including the stairs into the theatre, to take us into Jeff's flat. Co-directors Gary Field and Richard Lock had clearly put much effort into developing a pleasing ensemble of contrasting and amusing characters. It would have been worth bringing the script up to date in a few areas. The play was written in 1984, when owing £30,000 to the taxman might have been seen as an enormous problem. In the age of multi-million pound evasion and avoidance scams by the likes of Google and Starbucks, such sums come across as loose change. Adding a few noughts would have avoided such anachronisms. Aside from the line-learning issue, however, what might have made this production really sparkle was more heightened and spiky emotions – anger, panic, ridicule, desperation – play them big. Play them really big!. There is undoubtedly talent aplenty at Faringdon, but this time round it wasn't quite firing on all cylinders. Soz.